Congratulations Marcia. Please send me your address and I'll get your book and template in the mail to you. I love writing the IHAN blog....and I really appreciate all the wonderful comments folks leave. Thank you!! Thank you to everyone who left comments for the Cheryl Phillips post. If you are one of the winners, please e-mail me with your address. Good Luck and have a wonderful day. I'll be at the educational facility for my co-workers because they have a Hop-A-Thon and I'll be monitoring the little hoppers. Hmmmm....Big Hoppers here and Little Hoppers there.....there seems to be a theme emerging. Welcome to the IHAN blog. If this is your first time visiting, IHAN is short for I Have A Notion....my on-line Notions Store. Here at the IHAN blog you will find lots of great information about the latest and greatest Notions, interesting people and lots of giveaways (this is the third giveaway going on right now at IHAN). 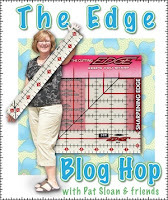 Pat Sloan has helped Sulivan's design some really neat new rulers. 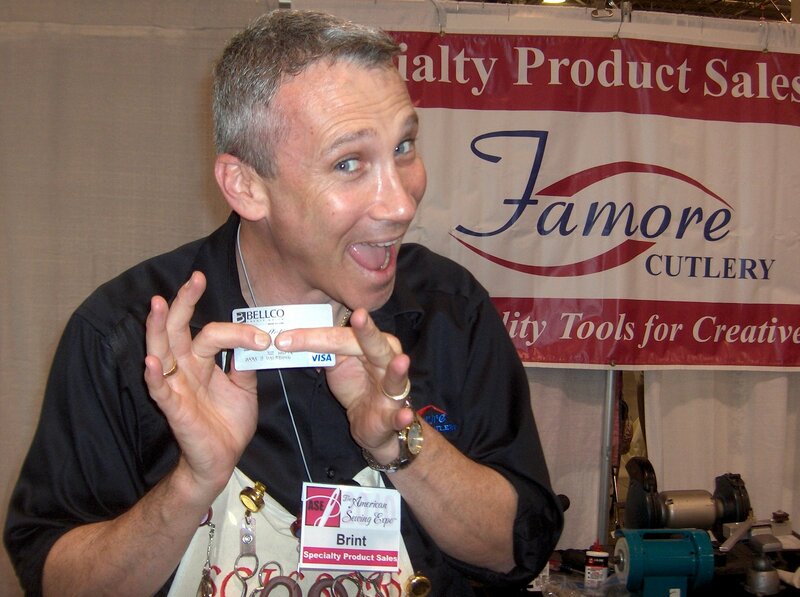 I bet you already knew that though....and you are here to enter the big giveaway....a full set....YES....10 Cutting Edge Sharpening Rulers!!!! I know how excited you must be so I'm going to give you a few minutes to catch your breath.....realx....get your heart beat and blood pressure under control. While you are relaxing, I'm going to share a few details about my quilting life.....just don't get so relaxed that you fall asleep. I consider this my first quilt because I took an official quilting class and this was my project. 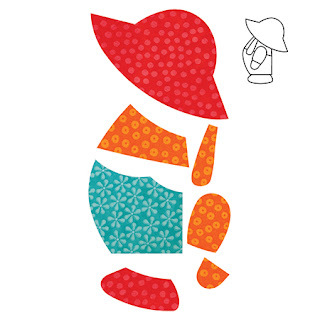 I chose the fabric for one simple reason, it had an elephant in the print, albeit very small, and I really like elephants. Each family member, living in my home at the time, was asked to choose a block pattern and then choose the placement of the fabrics. There were 6 of us and if we all still lived together that would make 8 now....make that 9....one is married. I did all the machine piecing and it was hand quilted by my very dear friend and amazing hand quilter, Mary Jane (IHAN's East Coast Director of Operations). Choosing fabric ..... well....there is a little history to my issues with choosing fabric. Several years ago I had signed up for a class to make a tote bag. The gal who was teaching the class told us to get some "inspiration" fabric. I asked her where she got hers and she told me the name of her local quilt shop. I drove an hour on a Saturday to the quilt store and read the end of every bolt in that shop. I could not find the word "Inspiration" on any of the bolt ends. When the sales lady was free, she asked if she could help and I asked where the "Inspiration" fabric was and she seemed puzzled. I was soooooo frustrated.....all I wanted was the darn fabric and to go home. I left empty handed and drove to a pay phone (remember those days?) I called the instructor and told her the shop no longer carried "Inspiration" fabric. She laughed so long and hard I thought she might just start snorting. Apparently "Inspiration" fabric is any fabric that inspires a person to create......OK....why didn't she just say that? Thankfully I have no issues with choosing great Notions!! How is your heart rate and blood pressure now? If you are relaxed....I'll get on with the big giveaway!! The Cutting Edge Sharpening Rulers are some darn cool rulers because they sharpen your rotary blade while you cut. Neat ay? I think so....and when you cut with them....they make a sound....the sound of the blade being sharpened....I was not expecting that and was pleasantly surprised. Pat Sloan and Sulivans clearly put a great deal of time into designing these rulers. Click here to learn more about all the details. The Cutting Edge Sharpening Rulers are available at local quilt stores, Pat Sloan's Quilt Shop, IHAN and I bet lots more places I don't even know about. Add the wet ingredients to the dry ingredients and mix. Then add 2 cups of water and keep mixing. The recipe says don't grease the pan.....I always spray the pans with Pam Cooking Spray but don't tell my mother-in-law ok? Cook on 350 degrees in the oven for 1 hour. Then you have a naked cake. If you like your cake aka breakfast to be covered....take some cream cheese and mix in a ton of powdered sugar and vanilla....add a little milk or water if you must....and smear it all over the top. If you see some pearly gates after the first bite......you know you followed the recipe correctly. Oh yeah, I almost forgot, IHAN will also choose a winner from the comments left on this post and that person will receive an autographed copy of Anita Grossman Solomon's book, Rotary Cutting Revolution, new one step cutting 8 quilt blocks. After all, you've got to put your new rulers to work right? Breaking News- IHAN has a "Cub" Reporter and this is the latest breaking news.....you saw it here first :) This is being published unedited. Raw Data/Coverage. Rock, Paper, Scissors! … or should I say Plastic? Greetings from The Rock – The 2010 American Sewing Expo at Rock Financial Showplace, Novi, Michigan. Could it be? OMW-Yes! It is Scissors Man!! Within the first minute of arriving, I spot him racing down the aisle, cell phone to his ear – a man on a mission. 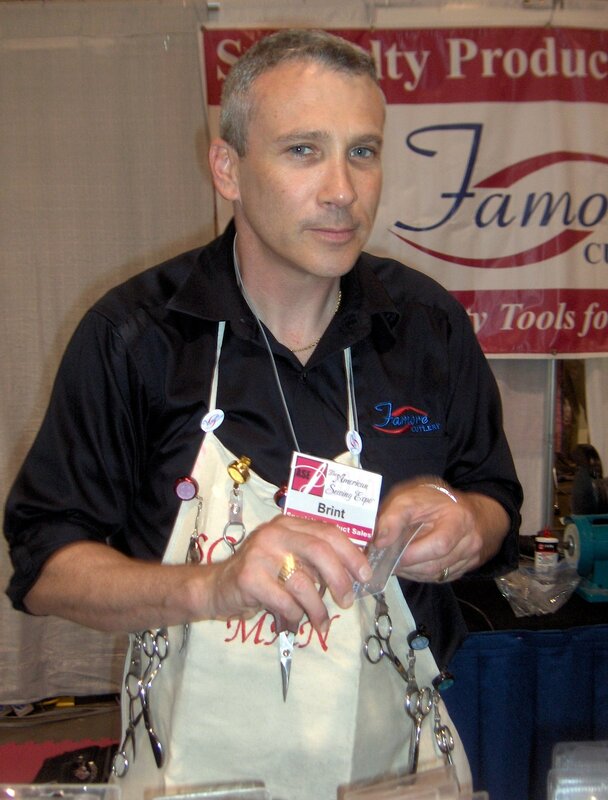 And, who would not recognize that apron!?! Since I am missing my traditional gig out west, I decide, spur of the moment, to come “up” from Ohio for a few hours. I’ve never been here before. Don’t know how big the place is or how crowded it will be. 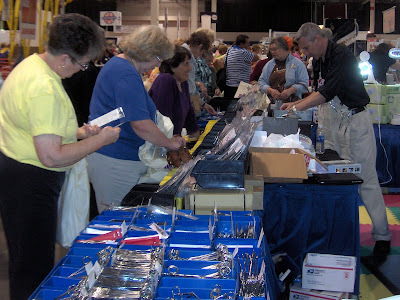 If it is anything like Quilt-a-Fair in Colorado, it can be tough getting down aisles and close to some of the booths, let alone actually talking to a vendor. 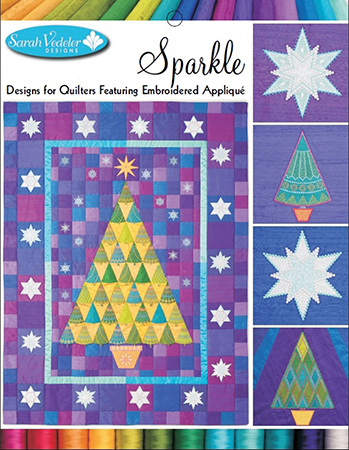 You know how those quilters can be! You know what I mean, the ones in their pin-studded, patchwork and embroidery-emblazoned vests and jackets. You do not want to get in their way! They are scarier than bikers! It is harder to get down those aisles this weekend at the Boulder County Fairgrounds than during the motorcycle swap meets there. I can say that ‘cause “been there, done both”! All this flashes through my mind in a matter of seconds. Was he a sprinter on the track team? What if I can’t find him again? I dash after him, determined to trip him if necessary. Screech! (sound of my shoes braking, suddenly stopping pursuit.) In that instant I know I must take my chances at finding him later. I now see that he is on a beeline for… The Men’s Room! Who knows, it could be his only chance all day! Luckily for him, the His lines are shorter than the Hers. Aha! (leaping from around the corner) Alright! Everyone! Step. Away. From. The. Tables! This is a stick-up! Hey, Brint! Off with the apron, Scissors Man!! P.S. This reporter will not be washing that cheek for a week! P.S.S. Check out earlier blog posts for Scissors shenanigans and shop at IHAN for Famore Cutlery if you missed Brint at Novi. I can only speculate that urgent phone calls were being made throughout the building to tech support regarding credit card machine wireless connections… or lack thereof. Luckily, it wasn’t a continuing issue and didn’t seem to affect scissor enthusiasm! And, remember, the next time your clerk asks “Paper or Plastic?” they may not be talking about grocery bags! Had I known I would be asked to file a report and take great pictures… This will have to do from my little amateur camera since I don’t have the IHAN big guns. And, I have even more appreciation for all the time, research, testing and creativity that Kelly puts into her blog! A Note from IHAN Chief Executive Officer- Thank you "Cub" for your excellent reporting. I think everyone in the Quilting and Needle Arts world needs to be forewarned....just because they don't see a tall red head with three cameras does not mean....you are not being watched!!! See, we do hide out in bushes. 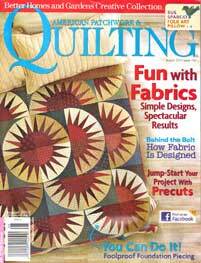 Kimberly's book, Jelly Roll Quilts & More , provides excellent instructions and lots of tips. Her writing style is easy and relaxed; almost like a friend is sitting next to you telling you what to do next. You won't be wondering what to do with your MODA Jelly Rolls or the 2 1/2 inch strips you cut with your GO! or Big Shot Fabric Cutters after reading this book. The "& More" means you also will be using your layer cakes, charm squares, etc too. 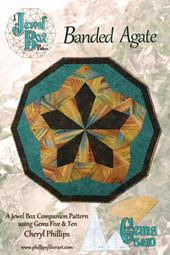 There may be a new review of Jelly Roll Quilts & More but the most recent I am aware of is in the August 2010 American Patchwork and Quilting Magazine. If you have the magazine run get it and if you don't, run buy or borrow it. 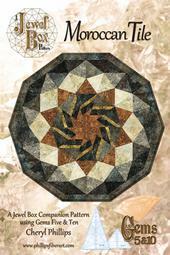 This is one of Kimberly's quilts, Half Hearted, from her book. This is an "Easy" level pattern....cheerful and fun isn't it? So if you would like to be the lucky IHAN blog reader to win the book and template, leave a comment on this post. If you have made one of Kimberly's patterns or taken one of her classes I'd love for you to leave a comment about your experience as well. The winner will be drawn Wednesday September 29th . Save at IHAN and get your new GO! 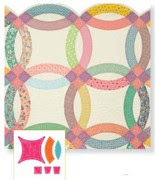 Fabric Cutting Dies (also compatible with the Sizzix Big Shot and Big Shot Pro). Mark Dunn, Owner and President of MODA Fabrics, is in IHAN's experience a WYSIWYG person. For those of you who don't know what WYSIWYG stands for, it means What You See Is What You Get and is pronounced Wizzy-Wig. 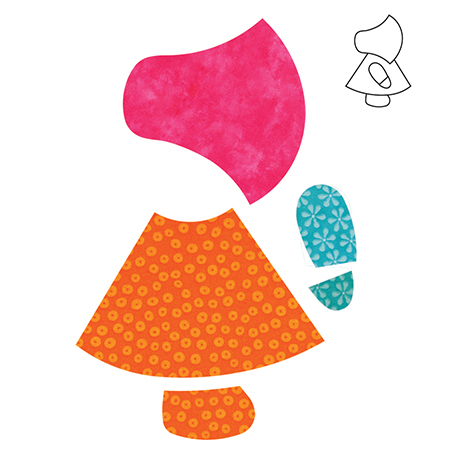 Please keep in mind that in the large world of Quilting and Needle Arts IHAN is a peanut , probably a half of a peanut....a tiny little company. Although I purchase items from MODA and United Notions most certainly there is no reason for Mark Dunn to even take the time to talk to such a tiny entity as IHAN. But you know what? Mark Dunn never asked who I was when I asked if he would take a break from his work and autograph an insert for one of his products. He promptly stopped what he was doing, smiled and pulled out his pen. Warm and friendly each and every time I've had the pleasure of being in his presence. I'm thinking that just might be part of the secret to his success.....being present, open and friendly. Did I mention generous? Yes, Generosity just happens to be one of Mark Dunn's characteristics. Again, I want to remind you I've done no real research on Mark Dunn.....I've never been to a MODA/United Notions warehouse ..... 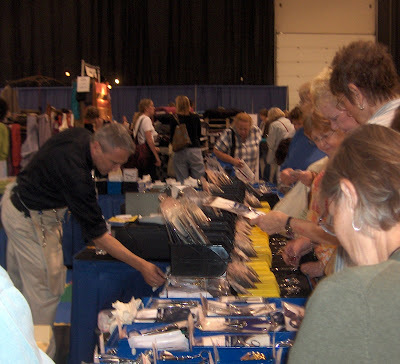 I'm just sharing what I know from my experiences at the last three Quilt Markets. Mark Dunn hosts an MODA Dinner at Quilt Market. This event is an opportunity for Mark and MODA to show their appreciation to their customers, designers, authors, etc. People typically arrive early and all the tables are taken and there is standing room only. The meals have been very good and the company excellent. Mark is welcoming his guests in Minneapolis to the MODA Dinner. I thought he looked like he was at the Academy Awards and you know what, I feel like I've been invited to a red carpet event too. After Mark welcomed everyone I approached him to get some more photos and thank him personally for putting on such a lovely event. He didn't brush me off or rush away to be with "more important people." Mark stopped to chat with me. He asked how the meal was and if I thought people were enjoying themselves. If I knew him a little better I would have hugged him and kissed him on the cheek. Although the food was very good.....the best part of the entire event is having the opportunity to meet new people and see some Royalty too!!! You know I was not going to miss taking these girls pictures. Look out Broadway.....here comes Holly Hickman and Erin Lawler. They both work for MODA and I absolutely loved their dress and spunkiness. Didn't take much to get these very fun girls to strike a pose. Like this angel...she was so precious my camera jumped off of my chest and took a photo of her all by itself (wee bit of truth stretching here). Rebekah Hache and her 3 month old daughter Shiloh having a ball at the MODA Dinner. After dinner the DJ starts playing the music and believe it or not.....folks hit the dance floor. Mind you, most of us have been on our feet non-stop for at least 2 days but when the music starts, everyone forgets their feet and heads out to the floor for some fun. While chatting with folks at the MODA Dinner in Minneapolis I glanced over by a wall and could not believe my eyes. An unattended bag.....there was not a person within 10 to 15 feet of this bag up against the wall. IHAN was sooooooooo goooooooood, all I did was photograph the LOOT. This was before EQ 7 was released and within my reach was not One but Two unattended Electric Quilt 7 Software. My heart pounded rapidly.....I contemplated the heist.....then I remembered my lady-like manners and just took the photo and left the lovely Tutto on Wheels with the TWO packages of EQ Software sitting quietly against the wall. Man if that does not get me into heaven.....nothin will!! What a wonderful evening and a great opportunity to be with some impressive people. Interesting word....Webster says it is to : Wait, Stay, and to be pregnant. 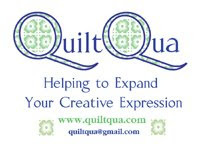 I spoke with an AccuQuilt employee today and inquired ....should I be making ruffled bloomers or boxers? I thought that just might tweak a tiny response....nope.....nadda.....nunca.....jamas.....darn it anyhow!!! There is not tricking the information out of them. I guess it is time to send in Maxwell Smart to spy on them.....or strategically place IHAN in the bushes near the AccuQuilt Headquarters.......I think it may be time to call upon my Jason Bourne skills and get the job done. And IHAN would....but we are doing a bit of our own Expecting. Yes, it is true....I've had a midwife here at IHAN Headquarters this evening. What exactly is in the incubator I can not disclose. Please don't be alarmed or get too overly-optimistic......but hopeful when the birth takes place....I'll be willing to take photographs and share......if not.....you may have to get some of your own Jason Bourne skills and camp out in the IHAN bushes....LOL. Mr. Wonderful Husband and Partner to Cheryl, Gary Phillips. Mrs. Rosemary had returned from the Hospital and was sitting at a table when she met Cheryl and Gary Phillips. As I mentioned previously, they had just flown in for Market. The three of them were talking when I arrived at the table with Mrs. Rosemary's wheelchair. Later in the weekend I had some time to sit and talk with Cheryl and Gary. They are very interesting and outgoing people. Cheryl was telling me that her rulers are based on Fibonacci Numbers. Fib-In Whoski Numbers? I had never heard this term and I studied lots of math in my college years. She had my attention for sure. Of course I was fascinated by Cheryl's patterns and her tools. To see more click here. ﻿ I think Cheryl's designs are interesting and would be so much fun to do as a group project. 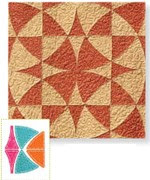 Wouldn't it be great to get together with a group of quilting friends and everyone make The Swirl out of different fabrics? Especially since there is a group at one of my guilds who have been doing quite a bit of their own fabric dying. Cheryl's website is definitely worth the visit. She also has some pattern updates to check out. If you would like to be one of the lucky ones, just leave a comment here on this post. IHAN will be giving away one of each of the patterns above and an Autographed copy of Quilts Without Corners Encore!!! PS. I will draw for winners on Monday Sept. 27, 2010....and if you don't see them posted....e-mail me please and remind me...LOL.